Neal (back row, center) moderated a panel that included Coleman (back row, right). 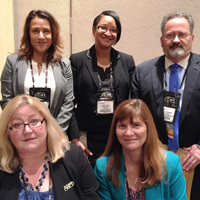 Webster University was well represented during the 2016 Council of College and Military Educators (CCME) annual symposium in San Antonio, Texas, with several Webster military directors moderating or speaking on panels. 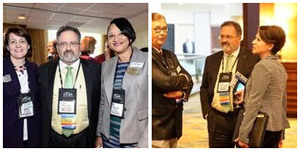 Sean Coleman, associate vice president for Military and Governmental Affairs and Regional Director/National Capital Region, Janice Neal, director of Webster's Los Angeles Air Force Base campus location, Margaret Reed, senior director at Webster Colorado Springs, and Sandra Kunz, regional director and Fort Sill director, attended and gain valuable insight into military education while networking with over 900 attendees and military representatives from all branches. Neal moderated a roundtable session, "The Potential Impact the Reduction of F2F Counseling has on Service Members," which included. Kunz enjoyed a visit with Pamela Raymer, ‎chief of the Army Continuing Education Division at Human Resources Command. Reed moderated a session, “A Soldier For Life: Start Strong, Remain Strong,” with the Army’s Career Skills Program, and introduced Sergeant Major of the Army Daniel Dailey as the closing keynote speaker of the event.